Jeffrey F. Hamburger's groundbreaking study of the art of female monasticism explores the place of images and image-making in the spirituality of medieval nuns during the later Middle Ages. Working from a previously unknown group of late-fifteenth-century devotional drawings made by a Benedictine nun for her cloistered companions, Hamburger discusses the distinctive visual culture of female communities. The drawings discovered by Hamburger and the genre to which they belong have never been given serious consideration by art historians, yet they serve as icons of the nuns' religious vocation in all its complexity. Setting the drawings and related imagery—manuscript illumination, prints, textiles, and metalwork—within the context of religious life and reform in late medieval Germany, Hamburger reconstructs the artistic, literary, and institutional traditions that shaped the lives of cloistered women. Hamburger convincingly demonstrates the overwhelming importance of "seeing" in devotional practice, challenging traditional assumptions about the primacy of text over image in monastic piety. 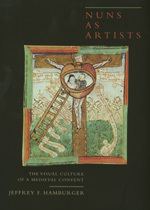 His presentation of the "visual culture of the convent" makes a fundamental contribution to the history of medieval art and, more generally, of late medieval monasticism and spirituality. Jeffrey F. Hamburger is the Irving E. Houck Associate Professor in the Humanities at Oberlin College and the author of The Rothschild Canticles: Art and Mysticism in Flanders and the Rhineland circa 1300 (1990). Among his several honors are the Gustave O. Arlt Award in the Humanities (1991), and the John Nicholas Brown Prize of the Medieval Academy of America (1994).